The Juno Beach Centre is Canada’s Second World War museum and cultural centre located in Normandy, France. The Centre pays homage to the 45,000 Canadians who lost their lives during the War, of which 5,500 were killed during the Battle of Normandy and 359 on D-Day. Opened in 2003 by veterans and volunteers with a vision to create a permanent memorial to all Canadians who served during the Second World War, the Centre’s mandate is to preserve this legacy for future generations through education and remembrance. The Juno Beach Centre supports the initiative to list the D-Day Landing Beaches as a UNESCO world heritage. A new temporary exhibition, starting March 1st 2019. 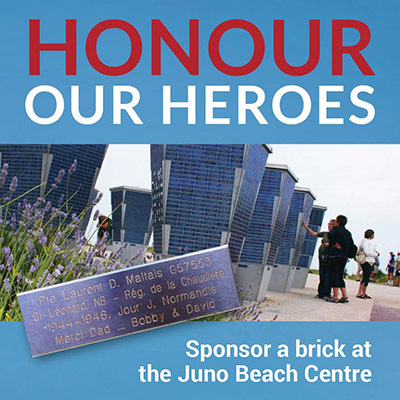 An outdoor exhibition on Juno Beach area who pays tribute to the actors and witnesses of the Second World War. Véronic, Vincent, Jacqueline, Eva and Hailey are the 2019 guides team. Friday, March 1st, 2019, the Juno Beach Centre inaugurated the temporary exhibition "Great Women During the War 1939-1945"
As part of the “été 2018, tous aux plages !” operation coordinated by the Normandy Region, on September 16, 2018, artist Dominique Colas created a frieze of more than 70m² on the sands of the Juno Beach sector.